I never had much sympathy for Charles Kennedy's politics. But he always struck me as a decent man endowed with great wit, warmth and sincerity. A man who served both his party and his constituents well despite a considerable handicap. There was an essential genuineness about the man, and a strength of character which helped him deal with his alcohol problems in a way that commanded sympathy and respect. These qualities may explain why he always seemed so uncomfortable and out of place with the grindingly negative and endlessly nasty anti-independence campaign. It just wasn't Charles Kennedy's kind of politics. Given his undoubted talents, abilities and personal qualities, not to mention the tragedy of his untimely demise, it is all the more disturbing to find hard-line unionists seizing on the occasion and manner of Kennedy's death as an opportunity to vent their mindless hatred of the Scottish National Party. This is but one example of the politics of obsessive, vitriolic hate being expressed in a few callous keystrokes and with varying levels of spittle-flecked vehemence by unionists in the wake of Charles Kennedy's death. There is a great sickness at the heart of the unionist cause. A rancid rottenness at its core. A bitter, bilious, British nationalist fanaticism has arisen which regards any obscenity as fully justified in defence of the British state. They won the referendum, but lost the country and have since been obliged to watch as those they supposed they had defeated were awarded all the prizes by Scotland's voters. Their resentment is implacable. All intellect is crippled by it. Rationality is abandoned in favour of base emotion. Propriety is forsaken for a revelry of petulant anger. Some of the decency in British politics died with Charles Kennedy. Whatever remained has been killed by the cretins who have laid claim to his newly deceased body, declaring it the moral high ground while using it as a vantage point from which to spit venom at their political rivals. I believe Charles Kennedy. Would be the first to laugh. I will have a drink to you Charlie. Slangs. I met him on one memorable occasion (it was memorable for me at least!) and, no surprise here, shared more than one wee drinkie. A remarkably nice and unassuming guy who was a thoughtful listener as well as the consummate raconteur. Most of his anecdotes were at his own expense! He didn’t give a fig which party anyone voted for as long as he could enjoy good discourse with a bit of cut and thrust. In his political life he was popular and successful because he took the time to assemble all the facts and knock down others who were not willing to be prepared. Not one to shoot from the hip he was always the epitome of reason and I think that this was what caused his overall appeal to be so wide. On more than one occasion I mused on what his support might have meant for the “Yes” campaign in 2014 but that was not going to happen. His endorsement could have had a huge impact on the final result. 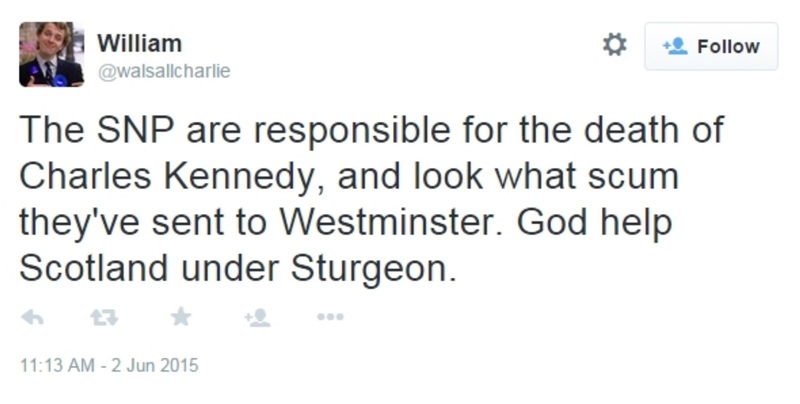 Charles Kennedy would be appalled at the way some are exploiting his death today for political points. He didn’t believe in scoring points for its own sake. He was altogether far smarter than that and embraced the big picture. A great voice of reason who will be sadly missed. And a big thumbs up for the comments. He would have been a positive and binding part of the YES movement. Shame he stayed loyal to BT. Must have been hard on him as he was aways complaining of they're dirty underhand tactics. RIP Mr Kennedy. A loss to the whole of Scotland. It's a great shame on more than one level. A great shame that such a man has passed much too soon. A great shame that he was a victim of his party's downturn in popularity. A great shame that he, and others similarly afflicted, had problems with drink. And an even greater shame that some people should wish to make political capital out of his untimely passing by throwing accusations and finger pointing. Such nefarious utterances truly are beyond the pale and I would like to think that those people would be taken to task because of it. It is also a shame that his political views led him away from the SNP. He would have been a great and remarkable addition to the ranks, had he been so inclined. I too had the pleasure of meeting Charles in the Park bar, Glasgow, just a stones throw from the university he loved and done so much for. The Park is probably the foremost watering hole for highlanders in the city and it seemed as if he knew everybody in the place many of whom were SNP supporters. He was very magnanimous, cheerful and came across as a true gentleman, a sad loss indeed. I never had the privilege of meeting the man. It's good to hear from those who did. Comment at the abuse he received from the cybernat and allegations of having his trash emptied over his drive when he lost his seat? Nope. Just pick one random tweet from somebody and then write a pointless rambling diatribe about it and Britishness in general. What a waste of time your blog is. Just as well you didn't spend any time trying to understand what was said. Yep not one word from you Peter about the activities of Brian Smith SNP convenor for Skye and Lochalsh engaging in vicious online abuse aimed at Charles Kennedy from you Peter, what a surprise! Instead we get a rant about "spittle-flecked vehemence by unionists", you could not make it up, sadly it seems like you do Peter. They could engage in genocide, and you would find an excuse to justify it. There are also questions for Ian Blackford SNP MP to answer, as did he know about this? Given that he and Smith were in each other back pockets and following each other on twitter and Facebook, that makes Ian Blackford's crocodile tears about Charles Kennedys death hard to swallow. 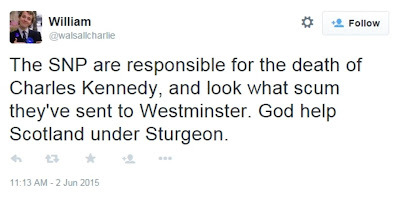 Perhaps that is why he was warned off from attending Charles Kennedy's funeral. Quite unwittingly, of course, you have just made my point for me.